This badge was issued to Cris Flores on 14 Dec 2018. 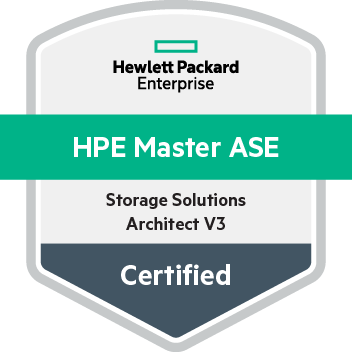 This badge validates the achievement of the HPE Master ASE - Storage Solutions Architect V3 certification. The certification verifies an earner's ability to identify enterprise storage and backup opportunities and plan, design, and size the right solution for multi-site environments. Also earner's are able to design solutions that include requirements to manage, monitor, administer, and operate as well as optimize, performance-tune, and upgrade your customer's HPE Storage solutions. Complete the prerequisite HPE ATP - Storage Solutions Architect V3 or HPE ASE - Storage Solutions Integrator V2 certification. Complete Designing Multi-Site HPE Storage Solutions, Rev. 18.41 course. Training is highly recommended but not required. Pass HPE0-J58 - Designing Multi-Site HPE Storage Solutions exam.